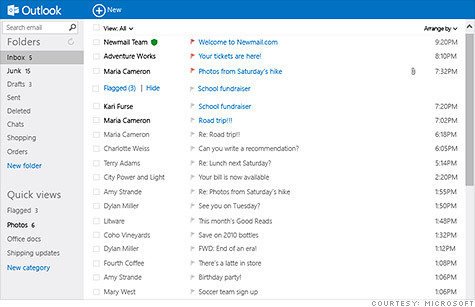 Microsoft's new Outlook.com service will gradually replace its aging Hotmail. The first thing users will notice about the new Outlook Web app is how much cleaner it looks than Hotmail or even Gmail or Yahoo. Microsoft claims to have reduced its header space by 60% compared to Gmail, which gets users straight into their email. Large, clear icons and commands appear only when relevant, and ads are shoved out of the way. They've been eliminated completely from person-to-person emails. The new user interface is nice, but the biggest changes come in the social aspects and artificial intelligence built into the new Outlook. Users of the new service can connect with Facebook (FB), Google (GOOG, Fortune 500), LinkedIn (LNKD) and Twitter contacts to get live social information and photo icons when they're emailing them. Even if a user is not connected on Facebook to their email recipient, Outlook will scan through Facebook's public directory to at least get that person's profile photo. Users can also IM with Facebook friends right from the mail client. Skype's video chat service, which Microsoft purchased a year ago for $8.5 billion, will soon be integrated as well. Outlook also brings some smart new features to regular old email. The service automatically detects and labels newsletters and promotional offers from stores. For emails that Outlook recognizes as an ad, it will add a universal unsubscribe button to the message. Click it, and Microsoft will not only unsubscribe via the retailer, but will automatically filter any future promotions into the trash if that unsubscribe gets ignored. Another innovative feature kicks in when you're sent an update about a package you've ordered. A button on the top of the message takes you right to the shipment tracking website. It's clear that Microsoft is going after Gmail users, some of whom are dissatisfied with recent changes to the service's user interface. The new Outlook makes porting over Gmail contacts very easy, and it understands Gmail keyboard shortcuts. You can even keep sending and receiving email from a Gmail address. That option lets Outlook invisibly take over behind the scenes. Microsoft's goal: To get to 1 billion users around the world. It's a target that Hotmail wasn't ever going to hit. With a new brand and some impressive features, Microsoft's Web email service might finally be cool again.